This fall, Pokémon Rumble Blast lets players take control of wind-up Pocket Monsters and battle it out. The game will be released this month in Japan as Super Pokémon Scramble, and it's a sequel to a WiiWare title. 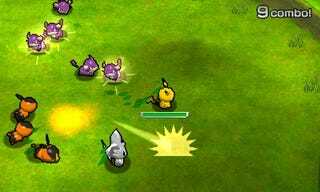 In Pokémon Rumble Blast, players can collect over 600 Pocket Monsters (including monsters from Pokémon Black and White), while playing with friends via wireless co-op mode. The game also has 3DS StreetPass features, enabling Toy Pokémon to battle foes they cross on the street and view other players' Miis. The game will be out in North America on October 24.